News may or may not have made it to you yet that the 90-year old tool brand may soon cease to exist. The black and yellow giant Stanley Black And Decker buys Craftsman from Sears for – $900 Miiillllllion dollars – pinky to the cheek with the best Austin Powers I can muster. What is the state of the Craftsman brand and all those warranties that were good for a lifetime? Don’t rush to your toolbox yet to find all those broken-tip screwdrivers, you may still have some time. It is no secret that Sears has been struggling to stay above water for quite some time. To earn some cash and extend the life of the fledgling retailer, Sears Holdings chose to sell off one of their revenue-generating arms. After under-performing again for 2016, the Sears empire seems to be on an inevitable track to deadville. Amid the news of the Craftsman – SBD deal is also the news of closing 150 Sears stores. It is interesting that the tool giant, Stanley Black and Decker buys Craftsman, since SBD already has their hands in the homeowner and professional’s toolbox. Among the brands of SBD are Stanley, Black & Decker, DeWalt, Lenox, Irwin, MAC, and Porter Cable (to name a few). Once you peel the proverbial onion back, it reveals much more than what is on the surface. The more we dig, the more it seems that tools could be just a small reason for this acquisition decision. Tools only account for 35% of the revenue under the Craftsman brand. What?!!! Did I just write that? Did you just read that? Yes, that’s right, only 35% of Craftsman revenue is from the sell of tools. You know when you walk in the doors of your local sears – and I mean the door that you walk in, not your spouse – what seems to be parked outside and all around those doors? Lawnmowers and other outdoor power equipment generate the bulk of revenue for Craftsman. Garage door openers and other product lines that SBD has no presence in brings in the rest. So this is making more and more sense and could be a genius decision for the black and yellow giant. DeWalt recently released their 40V outdoor power equipment line that includes cordless line trimmers, blowers, chainsaws, and more; however, no mower exists in the lineup. This is a great opportunity for SBD to capitalize on existing manufacturing partnerships and contracts already in play with Sears/Craftsman. Utilizing said relationships, maybe we see a cordless DeWalt/Craftsman lawn tractor in the near future. Where do the hand tools and mechanics tools fit in this? SBD already has MAC for their professional line of tools for mechanics, and even Proto for other industrial outlets. DeWalt tried on more than one occasion to sell their own line of sockets, ratchets and wrenches. Thus far, mechanics and gearheads haven’t latched on to trusting their wrenches to the same black and yellow that provide their power tools. So the question remains for the mechanic in us: will the Craftsman name be absorbed or will it continue to stand on its own under the black and yellow umbrella? Like it or not, agree with it or not, but Craftsman has branded itself in the heart and souls of father and sons for generations. I would have to imagine that many of you reading this (me included) received your first tool set as a gift of some sort, or it was handed down. Whether it was a ratchet set, screwdriver set, or a complete mechanic set, the Craftsman logo was most-likely present. All that said, another realization is that 90% of the Craftsman brand is sold through Sears and Sears’ stores. Roughly 10% of Craftsman is sold through Ace Hardware stores. Wow, this makes a lot of sense now. 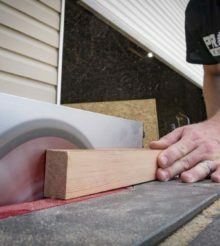 Almost immediately, after Stanley Black and Decker buys Craftsman, SBD could sell these Craftsman goods through the many brick-and-mortar stores and online outlets already selling SBD products. Albeit, I’m sure that contracts, partnerships and agreements have to be amended, but after some due diligence, this could be quick revenue growth for Stanley. Since the merger of Stanley and Black & Decker back in 2009, the giant has more than doubled in market-value worth. In 2009, the company was worth just $9B, and currently the SBD market-value worth is $18B. We consider that pretty substantial growth. The recent purchase of the Newell brands (Irwin, Lenox, etc.) seems to be a logical and beneficial acquisition. It stands to reason that SBD has the mindset, experience, and financial backing to acquire when the time and money is right. To see this in another light, there is also value in blocking a competitor from making a beneficial brand purchase, hence gaining market share. Even if the deal were revenue-neutral, this could be a great move for SBD to block one of the other tool flavors from the purchase. Add to this, the value of the millions of people talking about the Stanley Craftsman deal, hence free marketing for both. Sears is dying, SBD is thriving, and Craftsman is a successful brand with a notable heritage. Why shouldn’t this be a good deal for the companies involved, and for the market? As consumers, it will be interesting to see how this plays out. Competition is always good, but efficiency bred through growth acquisition can be as beneficial. This is especially true when concerned with our country’s job market. Most of Stanley’s products are made overseas, however Craftsman contracts with US domestic manufacturers that employ more than 3,000. With the new deal and structure, there is already discussion to have even more of the manufacturing done in the US. Adding more jobs to the US workforce and increasing manufacturing within our borders will definitely get the word-of-mouth advertising ablaze. The question remains whether the profit margins and/or market value continue to grow with more workers in the USA. Rest assured, if Stanley Black and Decker buys Craftsman and proves that USA manufacturing is as profitable, then we could very well see a great shift to follow. By the way, Stanley intends to continue to honor those lifetime warranties we have grown up with.